Published in Animal Science at December 2, 2014. By: J.-L. Rault, K. McMunn, J. Marchant-Forde, D. Lay. Gas alternatives to carbon dioxide for euthanasia: A piglet perspective. ARS-USDA. A humane, practical, economical and socially accepted euthanasia method. The use of nitrous oxide as an anesthetic/euthanasia agent may prove to be affordable, feasible and more humane than other alternatives. The neonatal stage is a critical time in the life of a pig, when they are prone to become sick or weak. This is the stage at which most euthanasia procedures are required if the pig is judged unable to recover. 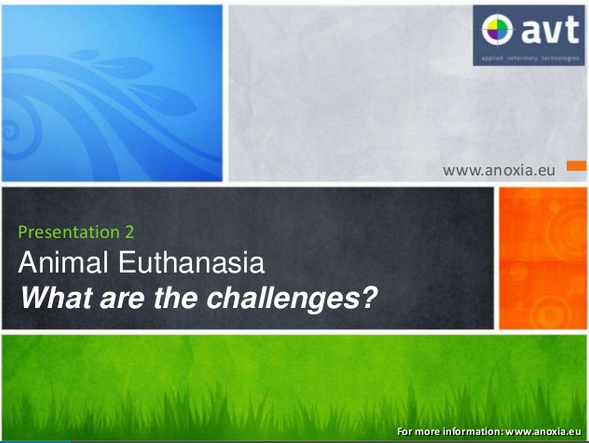 Any euthanasia method should be humane, practical, economical and socially acceptable to be universally accepted. How is the research setup? This research sought to: 1) identify a method of scientifically determining if piglets find a gas aversive, using an approach-avoidance test which relies on the piglet’s own perspective (Experiments 1 and 2), and 2) test different gas mixtures to determine if they are effective and humane for neonatal piglet euthanasia, using a two-step anesthesia-euthanasia procedure (Experiment 3). The investigators hypothesized that nitrous oxide, and alternatively argon and nitrogen, were less aversive than carbon dioxide and would induce anesthesia prior to using carbon dioxide to complete the euthanasia procedure. Pigs were allowed to walk freely between one chamber filled with air and another chamber either gradually filled with gas (Experiment 1) or pre-filled with gas (Experiment 2). Experiment 1 tested carbon dioxide, CO2 (90%) and air (10%); nitrous oxide, N2O (60%) and CO2 (30%); argon, Ar (60%) and CO2 (30%); and nitrogen, N2 (60%) and CO2 (30%). Since piglets had to be removed when they became panicked, the test was shortest (P < 0.01) for the pigs in the CO2 treatment compared to pigs in the N2O/CO2, Ar/CO2, and N2/CO2 treatments, 3.1 ± 0.2, 8.5 ± 0.6, 9.6 ± 0.4, and 9.9 ± 0.1 min, respectively. Nonetheless, all gas mixtures adversely affected the pigs, causing the pigs to leave the test chamber. In Experiment 2, piglets were allowed to enter a chamber pre-filled with N2/CO2 or N2O/CO2 (both 60%/30%). Pigs exposed to the pre-fill chambers entered a state of panic in less than 20 s, much faster in comparison to the gradual fill method, which support than this method was more aversive. 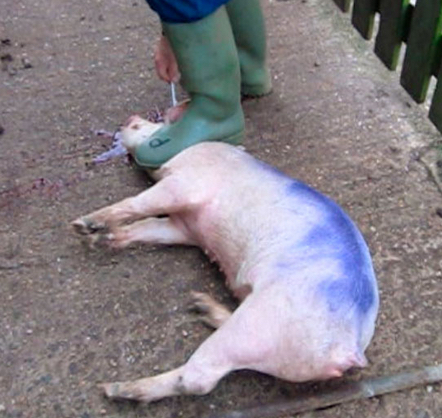 In Experiment 3, piglets were euthanized using a 2-step procedure. Pigs were first placed in a gradual fill chamber with 1 of 4 gas mixtures: 90% CO2, N2/CO2, N2O/CO2 or N2O/O2 (the last three mixtures at 60%/30%) followed by placement into a 90% CO2 pre-fill chamber when the pigs became panicked or were anesthetized. All three gas treatments that contained CO2 killed pigs more quickly than N2O/O2 (P < 0.05). However, N2O/O2 was the only treatment that anesthetized the pigs instead of causing squeals or panic, although requiring about 12 min longer. Although longer, a 2-step procedure in which pigs are anesthetized with a mixture of N2O and O2 prior to being euthanized by immersion in CO2 may prove to be more humane than CO2 alone. They found that nitrous oxide in oxygen appeared to be less aversive than nitrous oxide, nitrogen, or argon all combined with low (30%) concentrations of carbon dioxide or 90% carbon dioxide by itself. This study is the first to investigate the use of nitrous oxide at sufficiently high concentrations to cause anesthesia. Nitrous oxide, commonly referred to as laughing gas, has been widely used in human surgery and dental offices for its pain-relieving, sedative and anxiolytic effects. It is cheap, non-flammable, non-explosive, legally accessible and not classified as a drug in the U.S., and already commonly used in the food industry as a propellant for food products. Development of its use into an automated procedure will allow producers to implement it with little effort. Thus its use as an anesthetic/euthanasia agent may prove to be affordable, feasible and more humane than other alternatives. South China Morning Post, March 1, 2017. Experts said signs of resistance in a new strain of the deadly H7N9 bird flu virus against a drug used to treat people with the infection needs swift investigation to clarify how to handle the mutation. Two patients in Guangdong province with a new and more virulent strain of the virus have shown signs of failing to respond to the drug Tamiflu, the Nanfang Daily reported this week, citing Zhong Nanhsan, an expert in respiratory diseases. Virologists said the finding did not mean the drug was ineffective against bird flu, but a swift investigation was needed to assess how to handle the situation. There have been over 1,200 laboratory confirmed cases of human infection for bird flu in mainland China since the first was reported in 2013. As of Sunday, 94 people have died from the illness on the mainland this year. The number of deaths so far this year have already surpassed the total number of H7N9 fatalities last year, which was 73. The drug resistance was found in two patients found to have the mutation of the virus, the report said. The new strain was identified by the China Centre for Disease Control. Taiwan’s Centre for Disease Control announced earlier this month that gene sequence analysis of a H7N9 bird flu patient, who fell ill after visiting Guangdong, found the virus had a mutation that was resistant to antiviral drugs such as Tamiflu and Relenza. The patient, a 69-year-old businessman, died earlier this week. Zhong was quoted in the Nanfang Daily as saying most patients on the mainland were responding to Tamiflu treatment, suggesting the mutated strain of H7N9 was not the dominant virus, or “a considerable amount of viruses” did not mutate. He Jianfeng, chief expert in infectious diseases at the Guangdong Provincial Centre for Disease Control and Prevention, told the newspaper both patients with the new strain had taken Tamiflu before and it was not clear whether the drug resistance was caused by previous use of the treatment or the virus mutation. Professor Malik Peiris, a virologist at the University of Hong Kong who published a paper in the medical journal The Lancet four years ago saying H7N9 patients in Shanghai had previously shown antiviral resistance, said Tamiflu resistance occurred occasionally in bird flu patients treated with the drug before. His further work showed these patients can be treated with alternative antiviral drugs. Professor Peiris called for a quick investigation into the latest H7N9 virus mutation. “We need more information on how widespread this resistance is in recent viruses, especially those with the high pathogenic mutation,” he said. Tamiflu can still be useful for treatment and early use of the drug will reduce the chance of resistance developing and increase the chance of a cure, he added. Patients who have begun antiviral treatment need to be monitored to see whether there was a good response and to change to alternative drugs if there was no improvement, he said. Although commonly used in other settings, defining animal welfare as part of a CSR (corporate social responsibility) setting is not new. There are many ways to define CSR. What they have in common is that CSR describes how companies manage their business processes. This is to produce an overall positive impact on society. The phenomenon CSR is a value concept that is susceptible to particular ideological and emotional interpretations. Different organizations have framed different definitions – although there is considerable common ground between them. Some important national players of the food chain at different steps (mainly food retailers and food services) have included animal welfare in their CSR. The Anoxia technique is developed as alternative for existing animal stunning methods that are based on the use of CO2, electrocution, neck dislocation, captive-bolt, as well as killing methods like de-bleeding and maceration. In the past 10 years, Wageningen University and University of Glasgow conducted several studies that proved that the technique could be applied successfully for culling poultry (Proof of Principle Anoxia Technique). This was the start of the development of several applications based on the Anoxia principle, using high expansion foam filled with >99% Nitrogen. Last November 2016 the campaign started the launch of the commercialization of the Anoxia applications in Holland, Germany and Sweden, focusing on the areas where a solution is most needed: piglets (< 5kg) and poultry (> 3kg) on farms. After 10 years of research & development a revolutionary new stunning technique is introduced. Based on the principles of animal welfare as described in the Terrestrial Animal Health Code of the International Standards of OiE: The Anoxia technique – stunning and killing animals by placing them under atmospheric conditions in an environment without oxygen. The solution is not only simple and safe and cost-efficient; it is also not physically demanding to the farmer and his employees. The principle guarantees that the animal(s) are placed in an environment with pure nitrogen, once the high expansion foam, filled with 100% nitrogen, replaces the atmospheric air inside the container. From that moment on, the animal inhales pure nitrogen, an atmospheric gas that all living species are used to and that can be inhaled without any physical reactions because atmospheric air contains 78% nitrogen that is inhaled by every breath. The newly developed and patented technique is simple. All it needs is a soap dispenser connected to a water tap; a soap concentration; a bottle of pure nitrogen including a regulator; a standard waste 240/340/370 liter wheelie-bin container; and the Anoxia lit that closes and seals of the container. Inside the container, a high expansion foam generator is placed, connected to the water/soap and nitrogen through flexible tubes, connected to the inside of the lid. A chiffon is added to the lid, in order to allow atmospheric air to escape the container when it is filled with foam. According to the Standard Operating Procedure, the water/soap and the nitrogen tubes are connected to the electrical valves on outside of the Anoxia lid. Then the animal(s) are placed in the bin, next to the foam generator. The lid is closed and the foam production is started. After 30 seconds, the container is filled completely with foam. At the moment that the foam is placed in the container via the chiffon, the foam production is stopped and the chiffon is sealed off. Throughout the foam production process the animals remain calm. The high concentration of nitrogen replaces the oxygen in the blood and via the longs; nitrogen is transported to the organs instead of oxygen. The first organ that reacts is the brain that immediately shuts of consciousness. The contractions of the muscles start after the brain is no longer able to control the movements of the muscles and is not a sign of stress, like with traditional gas stunning methods, where oxygen is gradually replaced with gasses like CO2 or Argon. Therefore the Anoxia technique is the revolutionary alternative for existing stunning methods that are based on the use of CO2, electrocution, neck dislocation, captive-bolt, as well as killing methods like de-bleeding and maceration. The first application that’s introduced on market in Germany, Holland, Sweden and Denmark can be applied for Stunning and killing piglets less than 5 kg; – poultry > 3kg (turkey and parent stock); and embryos in partly-hatched eggs. For more detailed information on the Anoxia technique, please visit www.Anoxia.EU, or send your request for information to the N2GF team at info@n2gf.com and one of our consultants will come back to you as soon as possible. [at the picture – Large mobile sprayers spew sanitizers into Seongho Reservoir in Icheon, Gyeonggi, on Thursday, to prevent highly pathogenic avian influenza from spreading in the region.] Published at December 15, 2016 in the Korean Joonang Daily. It’s official – the H5N6 avian influenza (AI) virus that touched down in Korea one month ago. It has caused the largest amount of damage the domestic poultry industry has ever experienced with bird flus. That’s 284 farms hit, nearly 15 million ducks, chickens and quails culled, and more to go. No other AI virus in the past has killed this many birds. Egg prices are soaring, now fixed at around 6,580 won ($5.63) per tray of 30 at the largest discount retail chain, E-Mart. Paris Baguette raised prices by an average of 6.6 percent earlier this month, their first hike in almost three years. According to local experts, the crisis will last through April 2017 unless the government dramatically reforms current measures, which have been criticized for being far too weak. In an article published Tuesday, the Korea JoongAng Daily wrote that the first major government meeting discussing the outbreak was not held until one month after the virus was discovered on Oct. 28 in Cheonan, South Chungcheong, in the feces of migratory birds. By then, it had been a week since it reached nearby farms. On Wednesday, the Ministry of Agriculture, Food and Rural Affairs announced that it would “negotiate” whether to raise the national AI crisis level to the highest of the four-tier system, from the current level 3. On Thursday it was upgraded. “Things can really get worse unless the central government closely collaborates with regional governments and farms,” said Seo Sang-heui, a veterinary medicine professor at Chungnam National University in Daejeon. Kim Jae-hong, dean of the College of Veterinary Medicine at Seoul National University, warned that for the domestic poultry farming industry the next one to two weeks will be a matter of “life or death.” One problem is that regional governments are not doing enough to quarantine areas, due to a lack of human resources and money. In a recent investigation by the Ministry of Public Safety and Security, there were 20 cases in which a government office wrote on official documents they set up an AI control team for their communities, but did not actually do so. In Sejong City, a farmer was caught shipping off 100,000 chickens to his retailers last month and reporting to the government the next day that his farm appeared to be hit by AI. It later tested positive and authorities are now investigating whether he had known about the infection ahead of time. In a country where the government relies on farmers to report viruses on their own, and punishes those who turn out to have failed to take proper quarantine measures in the first place, many farmers hesitate to report their circumstances. Moreover, movement bans are imposed on poultry farmers and their vehicles at locations where the virus has tested positive, but rarely are these restrictions taken seriously. Published at 15 December 2016 in The Standard Hong Kong, by Mary Ann Benitez and Carain Yeung. World Health Organization director- general Margaret Chan Fung Fu-chun warns bird flu H7N9 is particularly worrying as it could be a flu pandemic strain. This is because H7N9 is unique as it does not make chickens sick but is deadly in humans. Sick birds could usually provide early warning for imminent outbreaks, Chan told The Standard. This comes as Macau reported its first human case of H7N9 yesterday. “The biggest challenge for the world is the next influenza pandemic,” Chan said. ASF is considered a major threat to Danish pig producers, largely due to its presence in locations of export and its highly contagious nature. With the industry continuously under strain to make sure extensive measures are in place to safeguard the country from the disease. Soren Sondergaard, vice-chairman, of SEGES Pig Research Centre, said that ASF prevention utilised a massive amount of the annual budget but was necessary as an outbreak could cost the sector billions of kroner. New regulations have been implemented to mitigate the risk, including new regimes which call for trucks to be thoroughly cleaned and held in a restricted area for a certain amount of time between transportation. In the event of an ASF spread, parts of Denmark would be closed off with immediate effect, in order to ensure the flow of production could still continue in other areas. As the virus is a noted problem in countries with vast numbers of wild pigs, Mr Sondergaard suggested that culling regimes could be another option to consider, as well as changing the drop off points where live animals are exchanged. New outbreaks of avian influenza have been reported among wild birds and poultry across Europe since the end of October 2016. The highly pathogenic avian influenza (HPAI) H5N8 virus is identified in Hungary, Poland, Croatia, Germany, Austria, Switzerland, Denmark, and the Netherlands. EFSA experts are supporting Member States in their data collection activities. These collections are aimed at identifying how the virus enters poultry farms and the risks posed by wild birds. This information will help EFSA to re-assess the risk of introduction of avian influenza into the EU. The risk assessment is based on new scientific knowledge. The updated scientific advice will be published in 2017. The European Commission has called on Member States to be vigilant and to reduce the risk of further outbreaks. They will do so by taking measures such as increasing biosecurity levels in poultry holdings and backyard flocks. EFSA has worked on this topic extensively in recent years. Its work has included a scientific opinion on migratory wild birds and their possible role in the spread of highly pathogenic avian influenza viruses.